1 It only takes three steps to cook this easy to follow rice balls recipe. For rice that’s more flavourful, you need to cook your batch of rice in the Knorr Chicken stock. 2 Now, grab a pan and turn the heat to high. Pour a bit of oil and throw in the onions before adding the ground chicken and Knorr Chicken Cube. Sauté until the chicken is cooked through. 3 Get a bowl and place the cooked rice and chicken together. Mix them well and form into a ball. Stuffed the mozzarella cheese inside then dredge in flour, dip in beaten egg and roll in breadcrumbs before frying them in hot oil. 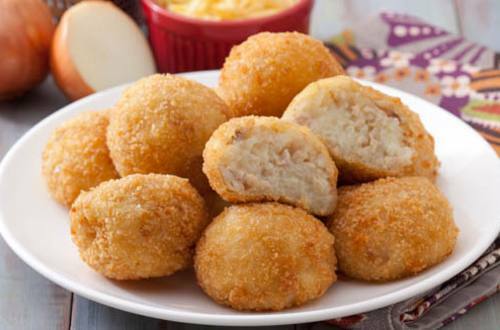 4 Whether it’s a snack or an appetizer, these Chicken Rice balls will be the talk of the whole family all day long.